For several years Great Aycliffe Town Council have been managing the wild flower meadows, the most notable location being near the railway station. The sculpture on the grassland depicts a common blue butterfly resting on an orchid; both of which are a regular sight during the summer. Meadows are managed by allowing the natural plants to flower and disperse their seeds before cutting and removing the vegetation in later summer. By doing this, the seed bank will improve over several seasons producing a richer show of flowers year on year. 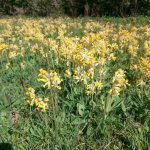 Recently a new meadow have been created in Woodham Park. Additional wildflower seed was added to the meadow to enrich the species’ diversity and extend the flowering season. Other particular species-rich areas can be found through Woodham Burn and in West Park. 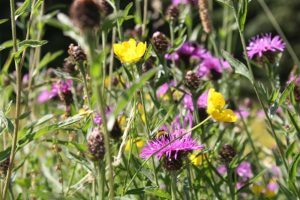 Many people walk by these meadows and may notice the impressive display of natural colour but on closer inspection these areas are often made up of a diverse range of plant species. If you would like to know more about these areas please contact the Works and Environment Manager on 01325 300700.